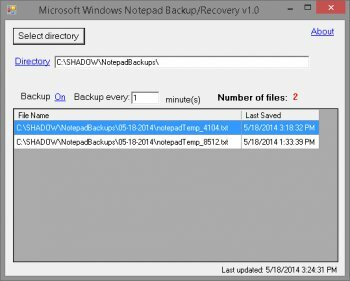 Notepad Backup Manager saves temporary files from unsaved Notepad instances - "Untitled - Notepad". If you use Notepad as a sort of scratchpad and have lost files because you didn't save them, this solution is for you. This program does *not* monitor files that have already been saved for practical reasons, although an option to do so may be added by demand/request. notepadTemporarySaver.exe is an AutoIT script I wrote and compiled to an exe that allows Notepad Backup Manager to grab the text from the "Untitled - Notepad" windows. Now that you mention it, I am not surprised it is flagged as a trojan because AutoIT is powerful and can be used to grab or do almost anything on a PC. NOTE 14 Sep 14: Got an email from the author explaining that he used AutoIT, which I know from past experiences may cough up a false-positive on some AV databases(my rating is now adjusted). My concern regarding this is now moot. Thank you Andrew for contacting me. One of the files in the zip "notepadTemporarySaver.exe" is noted as possibly containing a trojan through TrendMicro-HouseCall. Because of this I emailed the Author months ago regarding this but never received a reply. I have not tried the program because of the possible trojan and lack of response from the author. Maybe one of you more tech savvy visitors can shed more light on this one.